My idea of a perfect Mother’s Day is to escape to the beach or mountains for a relaxing picnic with my mom, my husband and our kids. We pack fat sandwiches, wedges of cheese, fruit and maybe a bottle of the bubbly for the adults. One of my favorite beaches is Carpinteria, located 12 miles south of Santa Barbara. The beach is super clean and has silky soft white sand. The gentle surf is ideal for swimming, boogie boarding and kayaking. We often see dolphins from the shore. If we’re in the mood for a picnic in the mountains, we head to Switzer Falls in the San Gabriel Mountains. Picnic tables and grills are available if you get there early enough. There’s an easy walking trail, about two miles that leads to a waterfall. To reach this picnic area, take the 210 east to Highway 2 north for about 10 miles. Park in the lot and cross a footbridge over a stream. A one-day Adventure Pass costs $5. For more information, visit www.fs.fed.us. Of course, California beaches and mountains are fun to visit year-round, not just on Mother’s Day. Following are some specific Mother’s Day activities. But you don’t have to wait for a special day to visit these fabulous places either. You can’t take the roses home with you but you can enjoy their beauty during brunch or tea overlooking rose gardens at Descanso Gardens, and Huntington Library, Art Collections, and Botanical Gardens. Descanso’s Mother’s Day brunch buffet is served from 9 a.m. – 1:30 p.m. May 8. $50 adults, $17 ages 4 – 10. For reservations, call 818-790-3663. 1418 Descanso Drive, La Canada. General information: 818-949-4200; www.descansogarderns.org. 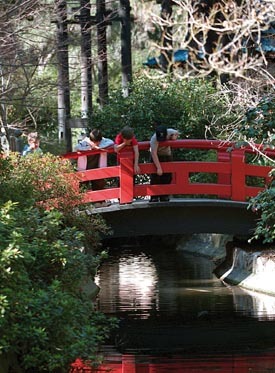 At the Huntington Library, a buffet is served in the Rose Garden Tea Room.$50 adults, $25 ages 4- 8. Or, dine Al Fresco with a gourmet country basket on the Garden Terrace Lawn. $189 for four. Reservations: 626-405-2249. 1151 Oxford Road, San Marino. General information: 626-405-2100; www.huntington.org. Start your day up, up and away in a California Dreamin’ hot air balloon ride. Watch the sun rise as you float over vineyards in Temecula Valley, situated about 90 minutes south of L.A. During the approximately one hour piloted ride you’ll travel about two – six miles (depending on the winds) above citrus groves and hillsides. You’ll even see Big Bear and Palm Springs. Kids ages 6 and older are welcome and can use step stools or peer through a peephole in the basket for a bird’s eye view. Following the ride, a gourmet breakfast is served at a nearby restaurant. Allow about three and a half hours total for your adventure. Rates start at $128 per person, plus a $6 pp fuel fee. Both sunrise and sunset rides are available. For reservations contact California Dreamin’ at 800-373-3359; www.californiadreamin.com. Come sail away with a Mother’s Day Brunch aboard a Hornblower’s yacht in Newport Beach or Marina del Rey. Boarding begins at 9:30 a.m. for the early brunch cruise, 10 a.m. – noon. The second brunch cruise is from 2 – 4 p.m. Cost: $75 adults, $37.50 kids. Locations: 2431 W. Coast Highway, Newport Beach; 13755 Fiji Way, Marina Del Rey. 888-467-6256; www.hornblower.com. The happiest place on earth offers wine tasting at Disney’s California Adventure. Relax on a terrace and tastings of California wines. Available by the tasting, glass or bottle. Prices start at $10 per person. 1600 S. Disneyland Drive, Anaheim. 714-781-4043; www.disneyland.com. For the ultimate spa treatments, soak up luxury at La Costa Resort and Spa in Carlsbad. While you indulge in a head to toe massage and unwind in a Roman Waterfall, your kids can make friends in the children’s programs. Kidtopia has activities for kids from infants to age 16. Kids ages 10 and older can hang in Vibz Teen Lounge (pay per play) decorated to resemble an underground mine and featuring music and dance activities. Rendezvous at Splash Landing, the resort’s complimentary aquatic area with three pools, three water slides and a water play zone. 2100 Costa Del Mar Road, Carlsbad. For rates and package deals call 800-854-5000 or visit www.lacosta.com.